2014 HELPMANN AWARDS WINNERS ANNOUNCED! 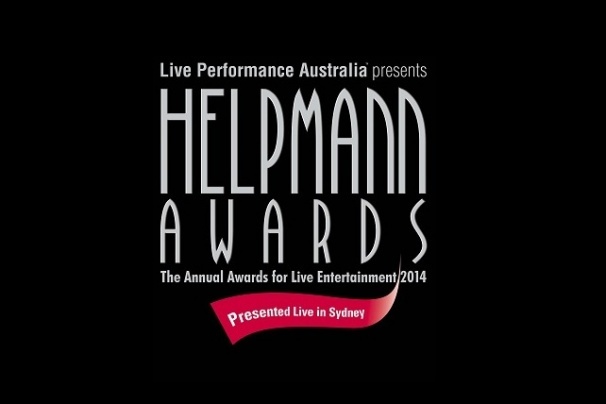 The 14th Annual Helpmann Awards were presented live from Sydney’s Capitol Theatre and broadcast on Foxtel’s Arena. Host Jonathan Biggins was joined by some of Australia’s most talented performers and industry leaders to announce this year’s winners while recognising the distinguished artistic achievement and excellence across the major disciplines of Australia's live performance industry. Forty four awards were presented tonight by some of Australia’s most celebrated talent including Geoffrey Rush, Nancye Hayes, Lucy Durack, Simon Gleeson, Pamela Rabe, Danielle Cormack, Simon Burke, Helen Dallimore, Teddy Tahu Rhodes, Craig McLachlan, Robert Grubb, Verity Hunt-Ballard, Linden Wilkinson, Kelley Abbey, James Reyne, Deborah Conway, Lucinda Dunn, Gale Edwards, John Robertson, Ursula Yovich, Craig Hassall, Martin Crewes, David McAllister, Rafael Bonachela as well as award-winning English director John Tiffany and Hollywood star Lou Diamond Phillips. Download the full list of 2014 Helpmann Award Winners here. Tonight’s ceremony took place on the spectacular set of Disney’s THE LION KING,previous winner of 4 Helpmann Awards including ‘Best Musical’. Showcasing Australia’s unique and diverse live performance industry, show highlights included live performances from Disney’s THE LION KING, Cameron Mackintosh’s acclaimed new production of LES MISÉRABLES, Baz Luhrmann’s STRICTLY BALLROOM THE MUSICAL and a very special medley from THE KING AND I with Lisa McCune, Teddy Tahu Rhodes and Lou Diamond Phillips. During the ceremony, Sydney Theatre Company’s acclaimed Wharf Revue served up a dose of their trademark razor-sharp, irreverent and anarchic political satire with some very special guest appearances by ‘Paul Keating’ and ‘Julia Gillard’. Additionally there were performances from singer Mark Vincent, Djuki Mala (Chooky Dancers) and The Zephyr Quartet from Adelaide. Opera star Taryn Fiebig was joined by Dominic Grimshaw to perform the Pie Jesu from Andrew Lloyd Webber’s REQUIEM for tonight’s In Memoriam segment. In addition, two very special awards were presented tonight in honour of two exceptional individuals for their lifetime contribution to the live performance industry in Australia, John Frost AM and Patricia Boggs. As previously announced, acclaimed theatre producer John Frost AM has been awarded the 2014 JC WILLIAMSON AWARD and Patricia Boggs, Australia’s best and most respected ticketing consultant, was awarded the inaugural SUE NATTRASS AWARD, which recognises outstanding service to the live performance industry in a field that may not usually enjoy a high public profile. This year’s Best Special Event Award was presented to Destination NSW forVivid Sydney 2013. NSW Deputy Premier and Minister for Tourism and Major Events Andrew Stonersaid: “The NSW Government is a proud supporter of the Helpmann Awards through our tourism and major events agency Destination NSW, and I congratulate all of tonight’s Helpmman Awards recipients. Winning a Helpmann is an outstanding achievement and recognises the recipient’s hard work and dedication. The NSW Government, through its tourism and major events agency, Destination NSW, is LPA’s Strategic Partner for the 2014 Helpmann Awards. The Helpmann Awards are the premier awards event for Australia’s vibrant live entertainment and performing arts industry. They celebrate the significant contribution the sector makes to the greater Australian community and recognise distinguished artistic achievement and excellence across the major disciplines of Australia's live performance industry, including musical theatre, contemporary music, comedy, cabaret, opera, classical music, theatre, dance and physical theatre. The Helpmann Awards also incorporate two industry achievement awards, the JC Williamson Award and the Sue Nattrass Award.